The Calgary Flames strode into Columbus tonight hoping for a good effort. The Blue Jackets are a good team with a scary-good power play. The Flames are the most-penalized squad in the NHL. The signs weren’t pointing towards a win. But the Flames played some nice, low-event hockey, defended well and got some great goaltending en route to a 2-0 win against the Jackets. That’s right: the cannon did not go off in Columbus. The opening period was fairly uneventful. The Flames had a power play and a penalty kill. They looked decent on both, but couldn’t generate anything substantial. They were a bit sloppy and made some weird puck decisions, so they were probably satisfied to not be trailing. Shots were 10-4 for the Blue Jackets. The Flames penalty kill was tested big-time early in the second, as Matthew Tkachuk went off for four minutes after drawing blood on a high stick. The Flames killed it off and a little bit after the kill, Kris Versteeg nabbed a giveaway in the Jackets’ zone and fed it to Troy Brouwer for the tap-in and a 1-0 lead. (Brouwer had a breakaway chance on his previous shift on a nice pass from Tkachuk that he just couldn’t quite corral.) From there, the Flames held on and defended for the rest of the period for the most part. Shots were 15-6 for Columbus in the middle frame. Columbus came out motivated to start the thrid period, but the Flames rolled with the punches, defended fairly well and drew themselves a power play. And despite playing defense for the majority of the game to that point, they made their PP count. The Jackets stole the puck and attempted to skate it out of the zone, but a head’s up poke-check by Dennis Wideman put the puck right on Micheal Ferland’s stick and he rifled a shot past Bobrovsky to make it 2-0. Back on their heels a bit in early third, but got a power play and delivered. Columbus can’t skate it out, Wideman poke checks it at the blueline, Ferland collects and rifles it past Bobrovsky. 2-0. Columbus got a late power play and an empty net, but even with a six-on-four advantage the Flames managed to defend well enough to prevent great chances and ice this one. Shots were 9-9. Give the Flames credit: they got better as the game wore on and they rolled with the punches. They got some panic out of their defensive zone play in the first period and had very little from there on out. Chad Johnson was the difference-maker at even strength, but the Flames did a really good job at their special teams and this was a rarity of a game where their PP out-scored the opposition’s. If that happens, your team usually wins. Tkachuk’s double-minor and the ensuing kill of said double-minor swung the game. Columbus had tons of time to get their offense running. They couldn’t, and the Flames scored a little bit after the penalty was killed and held on from there. 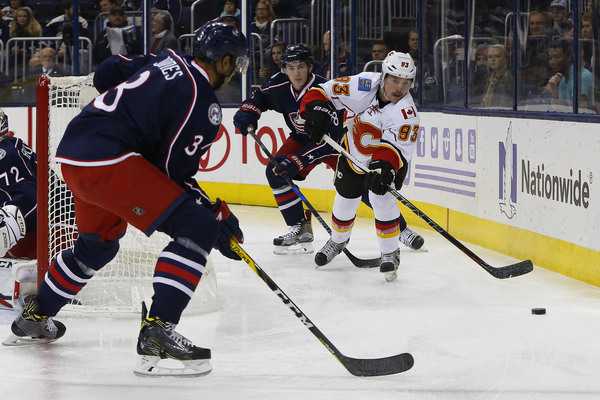 The game was Columbus’ for the taking, and the Flames managed to prevent them from taking it. Let’s go with Johnson, who made 34 saves and was by far the Flames best player at even strength. Stick-taps to Ferland (who battled in the offensive zone throughout the third), the rest of the fourth line (Hamilton and Hathaway had some nice pressure), and Matt Stajan, who seemed to calm down Sam Bennett’s game quite a bit. Versteeg collided with Brouwer midway through the second period (after a wonky pass by Monahan that got everyone crossed-up). He left the game twice, but returned and ended up playing the majority of his usual shifts. The Flames (9-12-1) head off to Boston, where they’ll play the Bruins in the fourth game of their mega trip on Friday night. So the worst team in the NHL led by the worst coach in the league and featuring the most useless and overpaid centre in the circuit has three chances to nail 2 points and head back to God’s Own from their longest roadie of the season at .500. Gee, so much for all that talk about falling skies, heard as recently as after the Buffalo loss. I think I’ll stick to Tre’s plan for at least another day. Not quite the worst team but 26 out of 30 isn’t good. Worst coach probably not. Most useless center probably not, overpaid, for sure! Tre needs to re-evaluate his team which I am sure he is. Monahan must be giving him nightmares. Monahan at the start of the season was the best scorer from his draft class, but agreed not a dynamic C. I’ve felt for a while that he could be a great 1RW with a different guy as 1C (perhaps Jankowski?) who is a bit more dynamic and better defensively. Our C position is definitely going through a shake-out and beyond Backlund it is difficult to know what it will look like in another year. At least currently with Gaudreau’s injury we get a chance to see Monahan away from JG and some other options rather than just accepting the thinking that JG/SM is an absolute given. He is playing well for a rookie, but someone needs to tell Tkachuk to keep his mouth guard in his mouth. You are supposed to learn to stop chewing on it in Atom hockey! He has moved to the top of my list for next Flames jersey. Brouwer and Monahan two of the worst players again… I don’t care how it gets fixed but this isn’t working. Monahan clearly isn’t a top 6 player and neither is Brouwer, both look to slow and can’t make a smart play to save their lives. I knew Brouwer was a bad signing, but lately he has been brutal. Monahan hasn’t looked good since Hudler left and it’s hard to say that he will pick things up. He has never shown any promise defensively, but his offense used to make up for it. If he can’t produce without Gaudreau, we will regret his contract. Monahan is a 23 rd old kid who has been carrying the Flames the last couple of years. This is the first adversity he has faced since turning pro. Part of his development so fans need to be patient. Benching/trading young players, firing coaches is an Oiler model of management….Treliving will stay the course and selectively and patiently make changes as he normally does. He is limited this year with the Wideman Engelland Stajan contracts…it will all get better! He has regressed and don’t blame it on coaching changes.. the guy needs to get speed into his skating otherwise he will never drive play and thus will be nothing but a 3rd line centre..
Michael Ferland 22 GP – 9 Points, Alex Chiasson 22 GP – 4 Points. Imagine what Ferlands point totals would be this year if he had Chiassons offensive opportunities to date. I can’t stand coaching biases, I can’t believe we replaced Hartley with an even worse coach for playing favourites. Keep Ferland where he is. He needs bangin’ buddies. If you move him his game changes. Special teams ok.
With due respect, I vehemently disagree. Ferland is a power forward, not a 4th line mucker. I am also beginning to believe Hathaway may be our future 3rd line/RW, but not this season. There’s way more to Hathaway’s game than “4th line mucker”. Jankowski, between these two, is how I see the future in my ideal Flames “Crystal Ball”. Ferland needs to play LW and be aligned with more skilled talent. He’s a natural playmaker, plays great both ways, and will eventually score 20+ goals in this league, sooner than later. As a fan of his sine his days as a Wheatie, it’s nice to see him potting goals and playing a game that may look wreckless, but is quite disciplined, really. Just look at his PLMs. Ferland can drop the gloves w/anyone currently in this league. And he will, in the right situation. Firtunately, his discipline and hockey “smarts” keep him out of the bin and on the ice, where he is most beneficial to the Flames. I hope he spend his entire career here, in Calgary. Teams that holds a playoff spot by American Thanksgiving has a 77% chance of making the playoffs. Ferland and Hathaway make 2/3 of an awesome 4th line. Looking at F. Hamilton I’m not sure what he brings to the equation. Is Jankowski considered to “green” to bring up–he would certainly bring more skill than Freddie and has enough size for the 4th line. Agreed. Never understood why Freddie was kicking around. He doesn’t screw up noticeably but he sure doesn’t provide anything offenaively. Freddie’s good from the dot, and plays good hockey both ways. He take far fewer penalties than his youger brother, and no dumb penalties. He may never score goals in double digits , but he’s a nice, affordable asset. I like him. He never gets himself, or his team, in trouble. I like him way more than Bouma, regardless of LW/RW. As a 4th line centre after Stajan’s days are over (I hope Stajan end up behind the bench here, or in Stockton, as an assistant – one of my favourite Flames for some time, as a person)… I can live w/Freddie as 4th line centre, with the ability to move into a 3rd line role in the pivot or on RW, if injuries hit us. Its strange, but perhaps human nature to see something that’s working and instead of enjoying it for what it provides, go on a hunt to “improve” it. The grass isn’t always greener on the other side of the fence, e.g. Hudler/1RW… It seems like there are a lot of other more serious issues with the team than trying to upgrade the 4th line. How about our 1st line, 1C/2C, PP, PK, and etc…..? Seriously. Who the heck are these guys? Are they good or not? This is maddening. Maddening I say! They are not good. Not at all. They ARE an NHL team which means they will win some games but man they have to scratch claw and fight for every inch. Just not skilled in their execution. Flip channels and watch a proper game between teams in the upper part of the standings. Night & day. You’ll even see scoring chances. Honest to goodness exciting plays. Ones we have not seen in the GG era. WW must be proud of his young protege. Not really good. They have played a few good games but mostly have played bad. If you’re talking the entirety of the season I might agree with you, but you haven’t been watching lately. In the last last 6 games starting in Minny, the only stinker was in Buffalo, which just so happened to be their 5th game in 7 nights and the second half of a league high number of back to back games thus far. I don’t know if the Flames will make the playoffs… which is more than I could say on Nov 12th after the Rangers game when I was convinced they wouldn’t. They have been playing better of late but I believe the loss of Gaudreau will catch up to them,sooner rather then later. Ferland would play really well with Bennett as his center in my opinion. Stick anyone as their other winger really, and you’ve got a good blend of skill, tenacity, “truculence” and speed. give ferland some more minutes my god, what else does he have to do!? Why is chiasson still playing more than him? Game notes: Gio played well, Of course Chad held the fort, Ferland was hustling and noticable. Backlund continues to impress and Bennett played with a little more intensity. Monahan was about the same as in not very good again. Solid team effort with the main Kudos going to Chad for the shut out! Is it too early to declare that we finally have a #1 goal tender?? Nope, let’s trade Elliott back to the Blues at the trade deadline for a second round pick…. Elliott will be left unprotected. And Vegas may take him. I missed most of the game, but it appears the line of Versteeg-Monahan-Brouwer may be worth time investment. Ferland-Hamilton-Hathaway; Hemailton and Hathaay know each other well from Stockton. Adding Ferland – Ferland’s the vet here. He’s the veteran presence. Love it. They somehow need to get him 3rd line minutes though. Put him on LW w/Bennett or Monahan. Like Backlund and Frolik, he seems to make others who play with him raise their game. I like Stajan w/Bennett, for now. Indeed a calming presence. Wise use of a cagey vet, full of wisdom. All we need a a three game winning streak to get us back on track. Elliott, Wideman will be good assets at the trade deadline…. I actually hadn’t considered to moving a goalie at the deadline. I’d consider it, the Flames will loose one next year anyway. Playing Backlund and Stajan more than Monahan is a good call by GG. Playing Bennett with Stajan is another good call. Both Monahan and Bennett at about 14 minutes is right for now based on their play. Wideman more than D. Hamilton has been good for Hamilton’s development this year – it shows, as Hamilton has steadily improved. Presently, the vets are generally carrying this team allowing the young guys like Monahan, Bennett, and D. Hamilton to grow and develop and not be overly burdened with the mental and emotional aspects of the game. For example, the vets play and if the result doesn’t come as they hope they don’t let it affect their play or confidence like it does for young players. The young players get overwhelmed and it can ruin them in the long run. This is excellent long-term development that will, in time, pay dividends but may not result in a playoff position this year. As for the style of play, the more I watch it the more it seems that it is a stronger and more sustainable style than the block and bomb style Bob had them play. Though I am not yet fully convinced, I’m not sure after 2o games or so I’m ready to declare it a disaster. It too will take time, especially since it is very different than before. Can the Flames please start Johnson every game.